October 2018 is Breast Cancer Awareness Month, which recognizes and supports individuals fighting breast cancer as well as the scientific institutions working to find a cure. This month, we reviewed all the discoveries, breakthroughs and findings so far this year from scientists studying breast cancer and its treatment. Some of these updates from 2018 are giving hope to breast cancer patients and their loved ones. Here are just six discoveries and advances from the fight against breast cancer that caregivers, home care aides and loved ones may find encouraging and hopeful. If you’d like to read about all the scientific discoveries and studies released so far in 2018, about breast cancer or one of many other diseases scientists are studying, the ScienceDaily.com website is a valuable resource. There are many walks, awareness campaigns and donation drives that caregivers, homecare aides and loved ones can participate in during the month of October. BreastCancer.org, WearItPink.org and Susan G. Komen For The Cure are just three of the many resources you can consult. 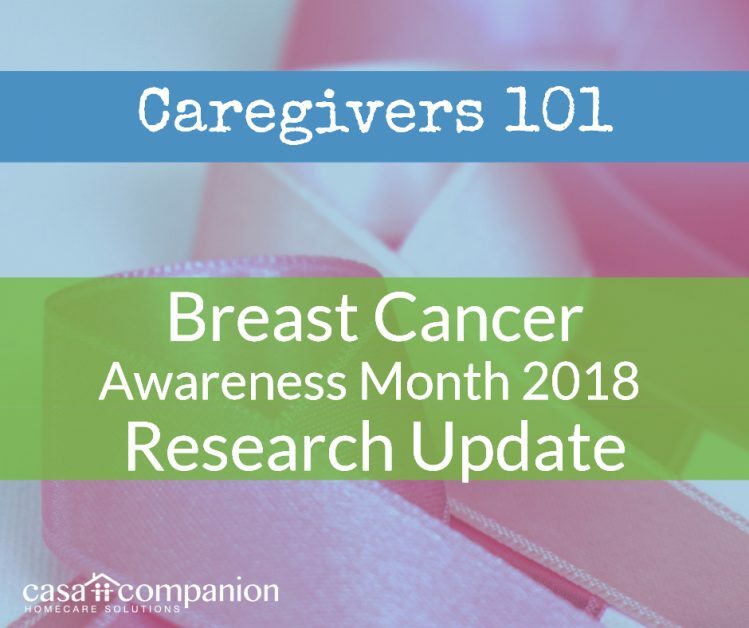 If you’d like more information on the signs, symptoms and early detection of breast cancer, the National Breast Cancer Foundation offers several guides you can download from their site.